Johnson’s argument tweaked the older, neoclassical assumption that poetic decorum mandates a correspondence between the language and social rank of a drama’s principal figures. Here a tragedy’s verse style has less to do with the nobility of those represented—as had been the case for John Dryden in An Essay on Dramatick Poesie (1668), where heroic rhyme’s “exalt[ation] above . . . common converse” images “the minds and fortunes of noble persons . . . exactly”—than with the intensity of the depicted afflictions. Tragedy needs verse not because its “elevation” allegorizes the status of its heroes, but because it corresponds to the magnitude of the drama’s subject matter, quite literally inscribing an emotional richness otherwise lost in the flatness of prose. Johnson’s intervention plays out a mid-eighteenth-century discussion of the representation of emotion on the tragic stage, disclosing an unease with the degrading (if not also disenchanting) effects of prosaic suffering. Contemporaries in the period worried that prose was “fine and nervous,” disconcertingly “artless,” and “offensive,” while at the same time mere “trifling,” “below the dignity of Tragedy,” and even, for that reason, somehow “unnatural” in its expression. Consider, for example, that Johnson himself asserts that affliction “raises [one’s] language,” lapsing—naturally, he suggests—out of the grittiness of prose into the elegance of the poetic. A sort of poetry in the raw, suffering reaches after what’s already aesthetic and universal to misfortune, while prose trivializes and bogs down in the particular, rendering a tragedy “hardly dramatic,” untrue to the genre and affliction it purports to represent. Writing a few years later, Henry Mackenzie saw the genre’s strength as its ability to simulate those very same particulars, “the ordinary feelings and exertions of life” that nevertheless remained in tension with the tragic. In his view, suffering of this sort was if anything too true, its realism overburdening one’s perception. “Real distress, coming in a homely and unornamented state,” he concludes, “disgusts the eye.” Obscuring its art with disturbing efficacy, the outward formlessness of prosaic suffering threatened to neutralize the pleasures of the tragic. These concerns spoke to a moment of renewed interest in bourgeois and domestic tragedy, capping a period of formal experimentation in Britain, France, and Germany that Peter Gay claims was crucial to the Enlightenment’s “emancipation of art.” Beginning around the production of George Lillo’s landmark 1731 tragedy The London Merchant, a series of important works fashioned a new aesthetic idiom calibrated to “the ordinary feelings and exertions of life” by working through varieties of verse, prose, and the visual arts. Scholars have long cited Denis Diderot’s Le Fils naturel (1757) and Discours sur la poésie dramatique (1757) as well as G. E. Lessing’s Miss Sara Sampson (1755), Hamburgische Dramaturgie (1767–69), and Emilia Galotti (1772) as key moments in the drama’s modernization. But a variety of lesser-known works such as Charles Johnson’s prose Caelia; or The Perjur’d Lover (1732), Lillo’s 1736 encore to The London Merchant, Fatal Curiosity (which contemporaries claimed produced domestic interiors to horrifying effect in the cramped Little Haymarket theater), and Trauerspiele like Clementina von Poretta (1760; by Christoph Martin Wieland) and Clarissa (Johann Heinrich Steffens’s 1765 dramatization of Samuel Richardson’s novel) played with the representational mechanics of what one might call “ordinary suffering,” inhabiting familiar spaces and embodied emotion in ways that contemporaries took to be radical departures from established tragic convention. Among the most revolutionary of these innovations was the sustained use of prose, which until then had been largely confined to the domain of comedy. 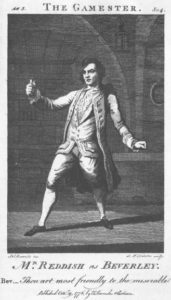 Indeed, in London, the 1770s and ’80s alone saw the production and publication of a number of prose tragedies, including notable revivals of The London Merchant and Edward Moore’s The Gamester (1753), curious adaptations such as The Fatal Interview (1782; a domestic tragic sequel to Pamela), quasi-gothic meditations on domestic violence like Richard Cumberland’s The Mysterious Husband (1783), as well as drames bourgeois in the form of Diderot’s 1758 Le Père de famille (translated “by a lady” as The Family Picture in 1781) and Louis-Sébastien Mercier’s L’Indigent (1772; translated in London and Edinburgh as The Distressed Family in 1787). Despite the concerns of those like Johnson and Mackenzie, by the latter half of the century, a deft use of prose on the stage could render the theater uncannily intimate, calling forth a space where private woe played out for all to see. ALEX ERIC HERNANDEZ is Assistant Professor of English at the University of Toronto, where he works on Restoration and eighteenth-century literature and culture. This essay is part of his book in progress titled Modernity and Affliction: The Making of British Bourgeois Tragedy.